The wonderful old growth forest of Brown Mountain in East Gippsland is now being logged. There are more than 50 trees over 300 years old in this area of forest, which is adjacent to Errinundra National Park. One logged tree has been radiocarbon dated to over 500 years old. Many more trees between 500 and 800 years old have now been logged. In addition to the Goolengook Block, a Labor Government will immediately protect remaining significant stands of old growth forest currently available for timber harvesting by including them in the National Parks and reserves system. This Brumby Government has broken this promise. The bulldozers moved in late October 2008 and clear felling of the forest commenced. It is worth noting that none of the forest areas specified for protection have actually been protected yet either, 2 years after the election. It seems that the Brumby government supports clearfelling old growth forest as "business as usual" despite the forests critical role in storing carbon (over 1000 tonnes per hectare) and providing water for the depleted Snowy River catchment. These forests also provide habitat for threatened species such as the Powerful Owl, the Spot Tailed Quoll, mainland Australia's largest marsupial carnivore, and the Long-footed Potoroo, Victoria's rarest marsupial. The endangered Orbost Spiny Cray has been found in Brown Mountain Creek. The government has claimed it is delivering a 5,000 ha link between the Snowy and Errinundra National Parks, but including this area of Brown Mountain is a vital part of this link. East Gippsland's forests have been heavily clearfell logged now for 35 years. Logging of heritage listed National Estate forests commenced in 1989. Brown Mountain was targeted for logging . Protests in the forests eventually halted the logging there, but the remaining old growth forest was not all protected. Brown Mountain was assessed and listed as an old growth National Estate area by the Commonwealth Heritage Commission in the 1980s, which means it has the same values as a National Park. The management of these areas were handed to the state government which promptly set about clearfelling them in 1989. The protests on Brown Mountain against logging there attracted much media attention when 300 people were arrested and charged with entering the area being logged. A moratorium was put on the logging while the state govermenet carried out a "Prudent and Feasible Study" into alternatives to logging National Estate listed forests. As compensation for the year-long moratorium, the Federal Government gave the State Government (Premier of the time - John Cain, Kay Setches was minister) $10 million. This was used to push new roads into the heart of the very areas being studied - in anticipation of the outcome. It was also used to carry out plantation trials in regrowth forests - part of the long-term agenda to convert publicly owned native forests into industrial tree farms. See History of Brown Mountain for more details. When queried about this decision to destroy the old growth forest, the response from Premier Brumby’s office was "since VicForests have moved the contractors in, there is nothing we can do". 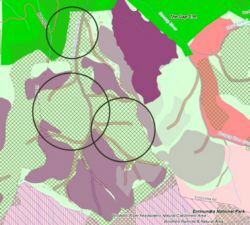 Victoria's Department of Sustainability and Environment's (DSE) own maps show that the area of Brown Mountain forest in question is old growth forest, which proves that it should have been included in the forest areas announced for protection in 2006, and therefore should not be logged. Labor's 2006 National Parks and Biodiversity policy included a commitment to create the Old Growth Forest Walk - Goongerah in the area of Brown Mountain old growth forest now being logged. The location of this walk has been agreed with DSE verbally, and during two site visits at Brown Mountain that included several representatives from DSE and the community. The promise to construct this walk at Brown Mountain has been broken by the Brumby Labor Government. If the entire area is logged as planned, there will be no old growth forest left to walk through. One of the logging coupes has even been named "The Walk" by DSE, which is a cruel irony. This area contains 3 highly contentious coupes (840-502-0015, 840-502-0019, 840-502-0020). Coupe 840-502-0020 is currently being logged. It is now within a designated "Public Safety Zone" and access by the public is therefore prohibited by the Victorian state government. The VicForests Couple plan for 840-502-0020 is called "The Walk". A total of 60 hectares (20 hectares per coop) has been allocated for logging. As at December 2, 2008 about 10 hectares has been logged from the first area. The logging activities are providing employment for 4 people for about 6 weeks. Over 80 percent of what is logged in East Gippsland ends up as woodchips, according to VicForests, as a claimed byproduct from timber harvesting. During the 2006-2007 over a 12 month period a total of 6,250 hectares of native forests was logged across Victoria. Brown mountain forest are among the most carbon dense forests in the world, storing in excess of 1200 tonnes of carbon per hectare in the trees, biomass, soil and leaf litter. This remains at a constant level in old growth forests. Between 500 to 1000 tonnes per hectare of carbon is released when this forest is logged, including leaves, branches and tree tops which are burnt, and log residues which then rot. Some carbon is stored long term in the timber and wood products that are produced from these forests including flooring, furniture and house framing. However, less than 2% of the timber that is logged ends up as furniture. Logging these specific Brown Mountain forests is therefore likely to result in excess of 10,000 tonnes of carbon emissions, none of which are accounted or paid for. The carbon emissions from logging this area alone are equivalent to an additional 2,500 cars on Victorian roads. "Will the minister confirm that three logging coupes at Brown Mountain in East Gippsland — numbers 840-502-15, 19 and 20 that are mapped by the Department of Sustainability and Environment as old-growth forest — have been approved for clear-felling this season, that one is almost fully logged, and that this is in contravention to the Labor Party’s 2006 commitment to protect the last significant stands of Victoria’s old-growth forests currently available for logging?" ..."Is there activity currently being undertaken in East Gippsland that is a source of contention in relation to the appropriateness of it being allocated for harvesting activity and being subject to protest activity?’, I can confirm that that is absolutely happening." "Subsequently the election commitment — which was that we would increase the reserve system within East Gippsland — at one level may have been interpreted to mean that there would be absolutely no logging in areas that may be seen to be old growth, but they are not mutually exclusive commitments. In fact the coupes in question continue to be in areas known as general management zones within the forest." Ms PENNICUIK (Southern Metropolitan) — The minister and I might disagree on what is on the maps. One of these logging coupes has been named ‘The Walk’ by VicForests in reference to the local community’s marked and tracked tourist walk, which was also committed to by the Labor government as the ‘Old Growth Forest Walk — Goongerah’. How is this consistent with the current logging operation? Again, this may be an area of contention.— It is an area of contention where people purport that there had been an alignment of a walk that had been adopted by the various state agencies. Despite the fact that there are many passionate and committed people — and good on them for being passionate and committed to environmental outcomes and sustainability in this area and generally — there has been no formal adoption of any delineation of a walking track by government agencies or the government that will define how the commitment to those walks will be delivered on the ground. Greens MP Sue Pennicuik has described the logging on Brown Mountain as "state sanctioned vandalism"
VicForests has attempted to defend the clear-fell logging of old-growth forest near Brown Mountain in East Gippsland. The East Gippsland manager of VicForests, Barry Vaughan, says "the area was not part of the State Government's election promise to protect more forests". In doing so, VicForests is ignoring the commitment made in Labor policy to protect the last remaining stands of old growth forests in Victoria available for logging. Unfortunately, Ms Haddow did not adequately address the concerns raised. She did not address Labor's broken policy commitment to "immediately protect remaining significant stands of old growth forest currently available for timber harvesting by including them in the National Parks and reserves system." She chose to ignore that fact that Brown Mountain forest should have been included in the forest areas specified for protection because it is designated as old growth forest by the Department of Sustainability and Environment and it forms an important part of the link between the Errinundra and Snowy River National Parks, the creation of which was also a policy commitment. Ms Haddow’s assertion that "logging occurs on a very small proportion of Victoria’s public land estate" is simply not relevant. No old growth forest should be now logged, as Labor's policy states. Bulldozing of mixed rainforest along Brown Mountain Creek in readiness to start clearfelling the adjoining stand of ancient forest. A logging contractor is being investigated for theft of burls. A huge old tree has been felled outside the coupe boundary – this is illegal logging. Used oil filters from bulldozers have been discarded on the ground which will contaminate soil and eventually water courses. Logging has continued against occupational health and safety regulations when members of the public are present. Worksafe is apparently investigating this. VicForests has prohibited access to the nearby Errinundra National Park via the tourist road for the past 3 months of summer holidays - with no alternative route offered. This is unacceptable. The public must have access to our National Parks. Anti-logging campaigners won a two-week reprieve after claiming to have discovered four threatened species in old-growth forest earmarked for harvesting. Scientists working on behalf of Environment East Gippsland say a survey last weekend found endangered glider, owl and crayfish species in a coupe at Brown Mountain. DSE is now conducting an ecology survey of the forest, which should have been performed prior to commencement of logging. If they confirm the presence of threatened species, as is likely, these forests will have to be permanently protected. Greens MP Colleen Hartland attended. "Considering that ancient trees like these have been chainsawed down every day across south-east Australia, no-one has ever been able to give a definitive age on the trees"
"They have got the bulk of a blue whale. They are just the land giants of the planet." "If this was a human artefact, it would be an incredibly precious antique, but because it is a tree they just think it can be cut down and sell it off for a song and most of it goes to wood chips." "We are hoping like hell that they are going to start realising that they can't replace these trees in the cycle of a logging cut. At the moment they are saying they are protecting a certain per cent so that is OK and they can log the rest." The tree that was radiocarbon dated was 10 metres in girth. Some trees logged have a 12 metre girth - by extrapolation they would be 800 years old. The first 20 hectare "coupe" of this season's logging allocation in Brown Mountain was completed on 22 April 2009. The pictures below illustrate the destruction, which including the felling of more trees 600 to 800 years old. There are two more 20 hectare coupes remaining. The officer of Environment Minister Gavin Jennings apparently now has the DSE report about threatened species and is considering what to do. It is not clear whether this document will be released to the public, or whether the remaining areas of Brown Mountain forest will be protected. Brown Mountain logging "arson - Government style"
Brown Mountain logging "public safety zone"
Brown Mountain logging "sterilising the soil"
On Friday 21 August 2009 Environment Minister Gavin Jennings released a DSE survey of Brown Mountain forest in East Gippland which states that high density populations of Greater Gliders and Yellow-bellied Gliders were found. This means they require immediate protection. No Long-footed Potoroos were detected, but some diggings were seen in the study area, and the forest type was assessed as good quality habitat for Long-footed Potoroos. The full DSE survey report is available here: Surveys for arboreal mammals (PDF - 133 KB). Jennings also announced that "an additional 400 hectares of Brown Mountain would be protected". This is political greenwash as that forest is already protected by Special Protection Zone. Unfortunately, the forest areas surveyed along Brown Mountain Creek, and their trees over 600 years old, will now be logged, even though they are designated by DSE as old growth. Environment East Gippsland has now taked out a court injunction to prevent the Government from allowing logging to proceed. A rare long-footed potoroo has made an 11th-hour appearance for surveillance cameras at Brown Mountain that could win the area a reprieve from logging. Environment East Gippsland co-ordinator Jill Redwood released a photo of an endangered long-footed potoroo seen foraging in front of one of the cameras near Brown Mountain Creek, between two of the logging coups. Environment East Gippsland and members of the Fauna and Flora Research Collective had been monitoring nine surveillance cameras in the disputed area for four months trying to capture proof and at 3am on Friday 21 August 2009 they were successful. 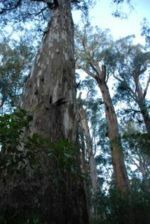 The Labor government Cabinet decision to proceed with the logging of Brown Mountain forest was challenged in the courts by Environment East Gippsland. The court provided an interim injunction to stop the logging (again) on 14 September 2009. Justice Jack Forrest found it was arguable that Potoroos were present in the logging zones. The environmentalists' case was strengthened by photographs showing logging and subsequent burning in a nearby area leading to the "apparent total obliteration" of the area being harvested. "To put it bluntly, once the logging is carried out and the native habitat destroyed, then it cannot be reinstated or repaired in anything but the very, very long term," Justice Forrest said. He ordered a temporary injunction on logging until a full trial, to be held as soon as possible to limit VicForests' financial loss. The trial was Gippsland early in 2010, then shifted the Supreme Court in Melbourne for its final hearings on 23 March 2010. Supreme Court judge Justice Forest compared images of a felled forest with a World War I battlefield and stated that the case had been strengthened by photographs showing the "apparent total obliteration" of a nearby site during logging and subsequent burning off. "To put it bluntly, once the logging is carried out and the native habitat destroyed, then it cannot be reinstated or repaired in anything but the very, very long term," he said. Justice Forest told the court: "I know what it was like before and I know what it was like after, and I've also seen pictures of the battlefields of the Somme." Around 50 supporters gathered outside the Melbourne Supreme Court on Tuesday 23 March 2010 with glider posters and banners to support the EEG legal case. The 7.30 Report and other media there to cover the event. 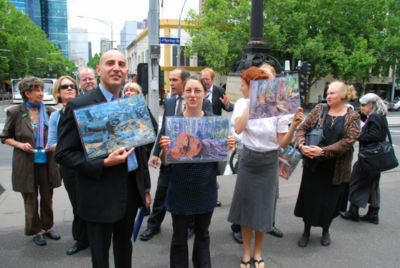 Inside the court, VicForests lawyers presented their side of the argument. On Wednesday 24 March 2010 EEG lawyers delivered their position and summed up their legal arguments. Debbie Mortimer SC is the lead barrister representing EEG. The Brown Mountain landmark trial concluded in the Supreme Court on Thursday 25th March after a 16 day trial. Justice Osborn has reserved his decision. It could take anywhere from one month to six months to hand down a finding. The four week trial has been marked by finger-pointing between government logging bodies VicForests and DSE about who is responsible for endangered species. The behavior of those charged with protecting our wildlife has been exposed to public scrutiny and the Supreme Court’s enquiry. EEG's lawyers made the case that the Victorian government doesn’t survey for endangered wildlife before they log old growth forest, because they don’t want to find anything that would prevent logging. The Court heard that VicForests doesn’t employ wildlife experts, and EEG has argued that both VicForests and the DSE sideline the opinion of the government’s biodiversity unit. EEG presented evidence of a new species of crayfish in Brown Mountain Creek, and expert witnesses claimed the stands of old growth are high quality habitat for two species of rare frogs, and the Spot-tailed (Tiger) Quoll. There only three remaining viable colonies of the Tiger Quoll are in East Gippsland. This case was fundamentally about whether irreversible damage would be caused by logging. The EEG legal team stated "You can’t get damage that is more irreversible than extinction." The outcome of this case will be important for the protection of wildlife in other stands of high conservation value native forests under threat of clearfelling. On 11 August 2010, the Supreme Court found that the government has a responsibility to look for and protect endangered wildlife before logging in the contentious Brown Mountain forests of East Gippsland. All threatened species in the court case, including the Long-Footed Potoroo, the Powerful Owl, the Spot Tailed Quoll, a new species of freshwater crayfish, and high density populations of Greater Gliders and Yellow-bellied Gliders were present in Brown Mountain forest and in need of protection. Additional protection zones for threatened species are required, subject to further scientific research and species surveys. “This judgment has implications for all native forests that are set to be destroyed by logging,” said EEG spokesperson Jill Redwood. “Victorians have always known native forest logging is immoral, uneconomic, unaccountable, unsustainable and unpopular. Today we’ve proved that where endangered species are present, or likely to be present, it’s potentially illegal as well”. “This extraordinary court case isn’t just about protecting Brown Mountain’s rich and ancient ark of rare wildlife; it’s about forcing the government to abide by its laws as anyone else would”, said Ms Redwood. Environment groups are now concerned that the government may attempt to alter the laws to allow the destruction of endangered species habitat, as happened in Tasmania in 2008. “The government must now honour the law, not alter it”, said Ms Redwood. 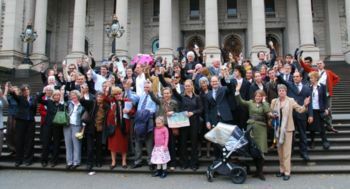 Forest supporters gathered at Victorian parliament on Thursday 12th August to ask the Environment Minister, Shadow Environment Minister and Greens for their response to the judgment. A year after VicForests were ordered to pay Environment Victoria's court costs, they still have not paid them. Brown Mountain - forest carnage or harvest? Brown Mountain "low value logs" - to be burnt? The old growth forest walk that was . . This page was last modified 05:42, 14 December 2011. This page has been accessed 407,658 times.